This is an attempt to catalogue the reasons why some wars are so difficult to stop - even when both sides want the fighting to end. 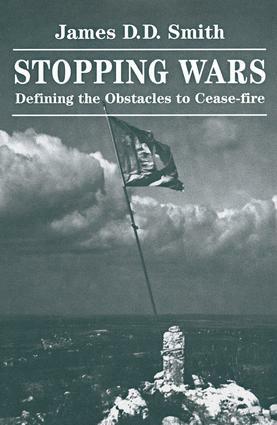 Through detailed case studies, the book assesses the obstacles and points toward solutions for ending wars more quickly. Each chapter is devoted to a specific obstacle which the author analyzes and then illustrates with case studies, drawing on such conflicts as the Iran-Iraq War, the Gulf War and the Yugoslav wars. He assesses the role of third parties in trying to persuade people to stop fighting and examines what happens when obstacles to a cease-fire cannot be overcome. Power and the Willingness to Settle: "Why stop now?" The Avoidance of Weakness and the Search for Strength: "WE will look weak"
Political and Cognitive Dissonance: "We'd never get away with it"
Making the Decision to Stop Fighting: "WE didn't consider it; THEY wouldn't listen; WE couldn't agree"
Unbridgeable Divides and Uncontrollable Armies -— the Inability to Cease Fire: "We can't give them what they want; We can't stop fighting"
The Cease-Fire Proposal -- Construction, Acceptance, and Failure: "WE can't make/accept the offer; the agreement didn't work"
Mediator Impartiality and the "Two-Hat" Dilemma: "You are not objective"
The Imposed Cease-fire: "YOU can't make us"